Carlsen won all three rapid games today to win the 2018 world championship and retain his title. | Photo: Maria Emelianova/Chess.com. Magnus Carlsen convincingly retained his world chess champion title by beating Fabiano Caruana 3-0 in the rapid match at today's tiebreak in London. All 12 classical games had ended in draws. Carlsen won 550,000 euros ($625,100); Caruana got 450,000 euros ($511,400). "I felt like I had a really good day at work today. Everything kind of went perfectly," said Carlsen. Carlsen's first reaction after winning today's tiebreak emphasized what had been critical for his victory: having a good day when everything is decided on just one afternoon. Caruana, who had played such great chess—definitely not worse than his opponent in the classical portion—couldn't say the same. "It wasn’t a good day for me and Magnus played very well," said Caruana. "I had a very bad start unfortunately, especially the second game." The kind of picture that says more than a thousand words. | Photo: Maria Emelianova/Chess.com. Carlsen’s decision to offer a draw in a better position on Monday had been heavily criticized by many chess fans, including former world champions Garry Kasparov and Vladimir Kramnik. Today, he gave them a proper reply. By winning all three rapid games, Carlsen silenced his critics and proved that his decision was both practical and founded in his confidence to win the tiebreak. Carlsen chose the path he felt would give the best chance to retain his title, and today he justified that choice. Carlsen was the first to arrive for the tiebreak. | Photo: Maria Emelianova/Chess.com. And he did not regret it: "Based on the information I had at that point I think I made a very good decision," said Carlsen. "There are some things that I had missed during the game, which kind of made me underestimate my position at that point, but I still felt that with the mindset I had and everything that I think I made the right decision. And not solely based on today." Adding to that, he couldn't resist addressing his two great predecessors: "As for the opinion of Garry and Vlad, then they’re entitled to their stupid opinion!" said Carlsen. Later in the press conference, he added: "I suppose if I had lost today part of me would have regretted my approach to the 12th game." The scene in the playing hall during the first three minutes of game one. | Photo: Maria Emelianova/Chess.com. Wednesday's rapid tiebreak was a highly anticipated event that had been announced by many mainstream media, including BBC, SkyNews and CBS. On site, once again, a few dozen photographers and cameramen showed up. Many of them arrived with the disappointing news that only a limited number of people were allowed to enter the playing hall, for three minutes, and for only one rapid game. Some of the reporters who had attended the whole match suddenly weren't allowed in. And, as we have also seen in recent world championship matches, during the games nobody—except for the official broadcasters—was allowed to record the most dramatic moments on camera. And the drama came early. Carlsen vs Caruana, shortly before the start. | Photo: Maria Emelianova/Chess.com. Carlsen opened the match with 1.c4, like he had done in games four and nine. Well, the one who played that first move today was in fact Lucy Hawking, the daughter of the famous scientist and visionary Stephen Hawking (Hawking, who died this March, was a fan of quantum chess). In an interview later in the day, she said that her father taught her the game and they played many games of chess together. With 3. g3 Carlsen tried a different move order. He sacrificed a pawn, traded queens and reached a slightly better endgame, which quickly turned into a won endgame as Caruana chose an active defense that was tactically flawed. However, instead of finishing it off directly, Carlsen played a few inaccuracies when a rook endgame was reached with some drawing chances for Caruana. The American player defended strongly and did reach a drawn position, only to throw it away with just minutes on the clock, missing a crucial check by Carlsen. Carlsen, who had shown a fist-pump right after his win, would later say that this game was the turning point: "I feel that game one was very critical for the match. It was very tense and it was the breakthrough for me. And then in the second game, I wasn’t too sure about my position, but after I won the first one I felt very calm. So for me the first game was the key." Carlsen's fist pump after the game, when finally a decisive game was played in London. | Photo: Maria Emelianova/Chess.com. With just 10 minutes between games, Caruana didn't have long to recover. He need to try and strike back immediately with the white pieces. In yet another 7. Nd5 Sveshnikov, the players followed game 12 for 11 moves, when Carlsen deviated and put his queen on b8. The Norwegian player didn't follow up strongly though, and the experts in the press room gave Caruana good chances to level the score around move 18. The move 21. c5, however, was too rushed. Where running with the c-pawn had been so strong in the eighth match game, here Caruana should have waited. The pawn became weak, his kingside was full of holes, and in no time everything collapsed. Caruana had to resign before move 30. FIDE officials (left-right) Berik Balgabaev, Emil Sutovsky, Arkady Dvorkovich and Viktor Bologan watching the games. | Photo: Maria Emelianova/Chess.com. Caruana suddenly had to win two games on demand, the first one with the black pieces. That was too much to ask against Carlsen, who had found this best form at the moment when it mattered. Playing 1. e4, Carlsen steered Caruana's Sicilian (a logical choice considering the situation) into a Maroczy Bind type of position, with Black having an active king's bishop compared to a regular hedgehog. Carlsen traded that bishop and continued playing healthy moves, but Caruana managed to keep some play in the position. However, after a sudden, tactical phase an equal endgame with QB-vs-QN appeared. Carlsen kept playing well, and Caruana had to over-press to keep chances. Soon it became clear that White was winning, and so, like in his playoff with Sergey Karjakin two years ago, Carlsen ended up winning a game in which he only needed a draw. Caruana resigns the third game, and gives up the three-week battle. | Photo: Maria Emelianova/Chess.com. "Of course I’m very disappointed," Caruana said. "I’ve always considered the main goal was not to play a world championship match but to actually become a world champion." The challenger thought that with some ups and downs for both, the classical part had been fairly equal: "I have some regrets about the classical portion but I don’t think I can really be upset about it," said Caruana. "I maybe missed two good chances and Magnus also had two—one completely winning position. So I can’t really say that I missed more chances overall." What you need to win a tiebreak is to find your best form, and Caruana couldn't. "It came down to today," he said. "I was hoping to play my best chess today but I didn’t come close to that." Caruana giving a short speech at the closing ceremony. | Photo: Maria Emelianova/Chess.com. Carlsen was still critical of his play, but noted a positive trend. "I feel like, frankly speaking, the last couple of years my game hasn’t been great," Carlsen said. "In that sense, this match, the classical portion, was a step in the right direction. I think I played relatively well. Fabiano is just a very strong player. I feel like I have things to work on clearly. I don’t have any great regrets." How does this championship compare to the previous ones? Carlsen: "It’s very special for me to win this time. I feel like that Fabiano was the strongest opponent that I’ve played so far in a world championship match. In classical chess he has at this point just as much right as I do to call himself the best in the world. I’m very happy to have overcome this great challenge. I’ll continue to work to get better." Carlsen was all smiles at the final press conference. | Photo: Maria Emelianova/Chess.com. The challenger was in good hands to be comforted after the loss: both his parents Santina and Lou Caruana appeared in the playing hall today after they had been in London for two days. They wanted to interfere with their son's play as little as possible, and only spoke to him via team member GM Cristian Chirila. Father Lou, who is often too nervous to watch the games live, made an exception today. He said it was at an early stage when he first thought his son could contend for the world title. Caruana at the press conference, with his mother Santina close by. | Photo: Mike Klein/Chess.com. Carlsen was gracious toward his rival at the closing ceremony. "Thanks to my opponent for a great fight," Carlsen said. "He showed himself to be an extremely strong player, versatile and very, very tough to beat. Obviously I am very happy with the way the match ended but I don't think we've seen the last from Fabiano in this particular context." "The match went the distance because of very tough defense by both players in tough positions," Carlsen said. "It just shows you how difficult it is to win games at this level. It was not for lack of trying, except of course in that 12th game, when it was exactly because of lack of trying!" Carlsen gave a pretty long speech at the closing. | Photo: Maria Emelianova/Chess.com. 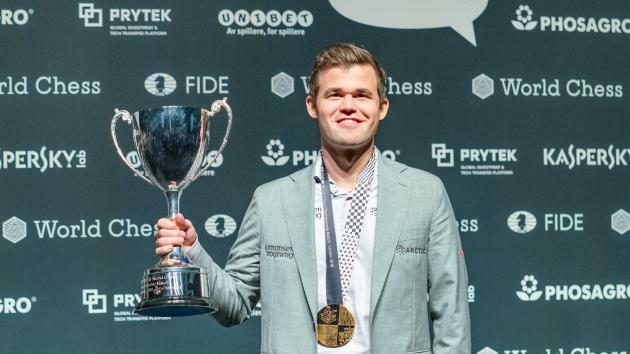 "At that point I made a sporting decision that I felt very comfortable with at the time, and I would have believed to be the right one, regardless of the result in the last game," said Carlsen. "I’ve been a chess professional now for many years and my chess career even dates further back than that. One of the things I have never done very well is listen to other people’s advice. I’ve always gone my own way and that’s what I did this time as well. I did what I thought was the best both practical and sporting decisions and it’s brought me this trophy today." FIDE president Arkady Dvorkovich at the start of the ceremony. | Photo: Maria Emelianova/Chess.com. At the closing ceremony, Ilya Merenzon of World Chess thanked the players for "making chess great again." The reference to the American president Donald Trump received mild laughter from the audience, and only minutes later FIDE president Arkady Dvorkovich countered: "Chess was always a great game and is a great game; you don't have to make it great game!" The 2018 world championship match has shown that the centuries-old game of chess has a great future as well. The online experience for chess fans especially has been better than ever, with a multitude of live shows in different languages produced by various chess websites. Chess.com's own show—with hosts GM Robert Hess and IM Danny Rensch and guests such as Hikaru Nakamura, Levon Aronian, Maxime Vachier-Lagrave, Wesley So, Hou Yifan and Bruce Pandolfini—broke all records on the final day as it reached almost 80,000 concurrent viewers. Combined with our shows in Spanish, Russian and other languages, Chess.com broke 100,000 concurrent viewers in total on Twitch. Ilya Merenzon of World Chess with Caruana. | Photo: Maria Emelianova/Chess.com. Dvorkovich giving Carlsen the gold medal... | Photo: Maria Emelianova/Chess.com. ...and the champion's trophy. | Photo: Maria Emelianova/Chess.com. Carlsen showing his happiness with a hard-fought victory. | Photo: Maria Emelianova/Chess.com. A final group photo with officials, organizers and players. | Photo: Maria Emelianova/Chess.com. Mike Klein contributed to this report.